Gundam’s original backer, the toy company Clover, declared it a failure. The ratings were not impressive, barely scraping a 5% audience share, back when 5% was nothing to write home about. The complex storylines were thought to alienate many young viewers. Not long after the first episode aired, 40 years ago on 7th April 1979, the sponsor called for radical changes, but the next six months were already largely locked in and coming down the pipeline. Clover cancelled the show with two months still to run of its contracted 52 weeks, and there it should have ended. Gundam only started to take off in re-runs, after the Bandai company found success in July 1980 with 300-yen model kits, the GunPla, based on the show’s war machines. “It was,” wrote Toshio Okada, “not really Gundam that became a social phenomenon, but GunPla.” By the beginning of the 1980s, there were Gundam fan clubs in schools and colleges – a demonstrably older audience of model-making consumers was enjoying the show alongside the kids who were supposed to be watching it. Gundam was a feature of nascent costuming culture; sequel shows would soon continue its mix of drama and tragedy alongside relentless mecha product placement. In an attempt to capitalise on the new-found love for the show, its makers re-cut the original TV series into three movie-length features. The director, Yoshiyuki Tomino, promised to be on hand at the first film’s premiere, where he planned to make a “declaration of a new anime century” (anime shinseiki sengen), on 22nd February 1981. 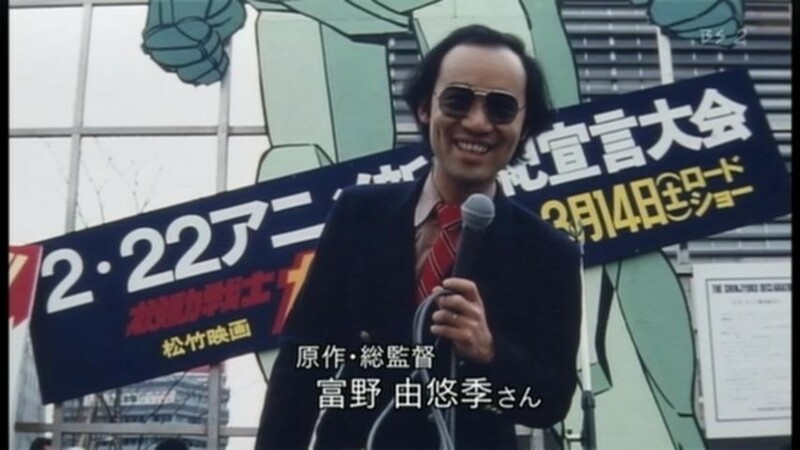 When Tomino’s plane got in from Osaka at nine in the evening, he faced a delegation from the Shochiku publicity department, reporting that 300 fans were already camping outside the cinema. Tomino didn’t give it much thought. He was half-expecting the hard-core to turn up early, and busied himself with the plan for the next day, which would involve taking to the stage after lunchtime, and making his “proclamation of anime’s new century”. This was what the press releases had been promising, and it amounted to Tomino’s evangelistic challenge to the industry to accept what fandom had become, or was about to. It had been eighteen years since the broadcast of Osamu Tezuka’s Astro Boy. The kind of nutcases who were camping out overnight in Shinjuku had been kids then, but now they were on the cusp of adulthood. It was time, thought Tomino, that anime itself grew up, and admitted that there was an adult audience. He had watched them, he wrote in his memoirs, grow through the 1970s, from primary school to middle school, to high school. Now they were going off to college, and that was fated to change the kind of anime they wanted to see. He would, of course, be proved right. The video era was only a couple of years away, and with it would come the technology to distribute more mature works direct to these newly adult consumers. College-age manga readers would soon thrill to Otomo’s Akira, and self-styled otaku would pile into 1980s sci-fi conventions, armed with tapes of their favourite shows. The video recorder, as the historian Yasuo Nagayama later wrote, was an invention tantamount to “time travel”, allowing enthusiastic viewers to share the thing they’d discovered with others for the first time. Within the decade, some of those very fans would be taking over the anime industry itself. By the morning of the 22nd February, there were 2,000 fans at the east exit to Shinjuku station. Tomino wryly observed that a TV director’s life was often lived hand-to-mouth, worrying about little more than the next meal, but here, outside a cinema for one of anime’s first big grown-up movie events, we were seeing the true power of television – its ability to attract an exponentially larger number of viewers. TV people had always been excluded from the movie world – now, suddenly, he saw that they had taken it over. The posters were gone by 10am. By midday, Tomino estimated the numbers were pushing 15,000, which threatened to turn the event into a riot. Ever since the Anpo Protests over the controversial US-Japan Security Treaty (an event later referenced in the opening unrest of Akira), “public demonstrations” had been illegal around Shinjuku station. Enough Gundam fans had now gathered to risk attracting police attention, and Tomino fretted that an injury in the crowd could attract exactly the wrong kind of media attention. His “new anime century” risked dying before it could even begin, with future events shut down as too dangerous. The publicity people decided to start early in an attempt to quell the mob. Tomino tried to bellow out his thoughts in as clear a fashion as possible, although ever since, he has regretted his lack of on-the-spot eloquence. Tomino spoke from the stage, but doubted anyone heard him. At 40 years of age, he already belonged to a different generation. 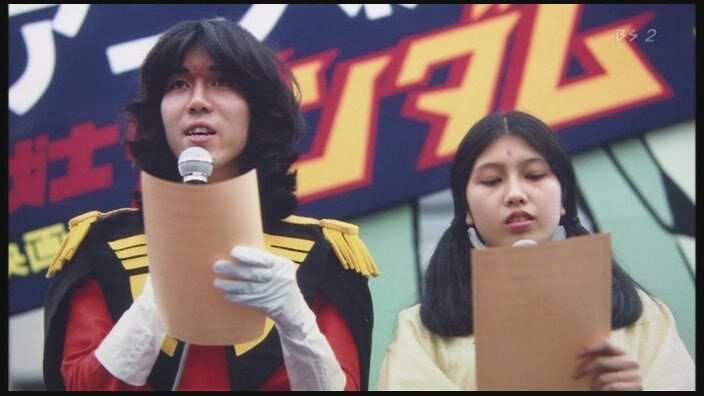 Ultimately, the proclamation’s official delivery was read out by “the kids” themselves, two young students, who were both already intimately involved in Tomino’s new era of anime: Mamoru Nagano, the future creator of Five Star Stories, and Maria Kawamura, already a voice actress in several Tomino productions, fated to become the iconic Jung Freud of Gunbuster. Both had arrived dressed as Gundam characters, Char Aznable and Lalah Sun. It was, wrote Tomino in 1981, one of those “costume play” things, although he hadn’t really been paying attention at the time. A decade later, the couple would be married, with Tomino and his wife serving as official matchmakers. The declaration might have been hurried and garbled, but it helped clear the crowd before they blocked the traffic. It dispelled the incident before it could turn bad, but also ensured that it got noticed. A generation later, an article in the Asahi Shinbun described 22nd February 1981 as “the day that anime changed”, although a cynic might question the degree to which Tomino and his gang were reacting to the situation or knowingly shaping it. As his hurried address effectively admitted, it was less of an event than an event horizon, a critical mass of people, designed to attract attention purely for existing. I have never quite believed the numbers, noting that extant photographs certainly suggest a crowd in the thousands, but that the higher five-figure estimate is based solely on the exhaustion of the supply of free posters, and does not consider the possibility of greedy fanboys grabbing them by the handful. And besides, who brings 10,000 freebies to a screening that could barely hold a fraction of that number…? 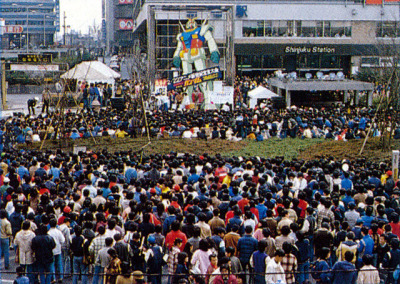 Nor was the Gundam “new century” event the last time that performatively poor crowd control at a premiere generated its own press – there would be, for example, similar drama later that year at the opening event for Sailor Suit & Machine Gun. Tomino had not been the only anime industry figure to notice a shift in viewer demographics – Tadao Nagahama, Noboru Ishiguro and Yoshinobu Nishizaki, to name but three, had also commented on the rise of the high-school-age fan in the 1970s, or at least were ready to claim that they had by the time I got around to reading their reminiscences. And Bandai itself had been arguably ahead of everyone’s game by getting in on Gundam with model kits for older hobbyists, before fandom even knew that was going to be a thing. Gundam’s success came in the wake of a similar astroturfing for its rival Space Cruiser Yamato, which had also been managed from behind the scenes by a producer mobilising fan labour: fly-posting, repeatedly requesting the theme song on radio stations, and managing staged “events” to encourage the media to report it as a cult success. But Tomino’s work was the most likely to appeal to the new, older age bracket. He had, after all, repeatedly come under fire in the 1970s for writing storylines that were too mature and hard-hitting in his kids’ shows, and in the new fans, he finally saw an audience that would finally get him. His time had come, although it would not be long before many of the fans that he appealed to were making their own works, often in reaction to the baseline that he had helped establish. One, indeed, even was named in a cheeky reference to his “declaration of a new century” event, Shinseiki Evangelion. Tomino had become the self-declared prophet of a new age, but his new world order would belong to others. Jonathan Clements is the author of Anime: A History. The Gundam series, its movie reissue, and several of its sequels, are released in the UK by Anime Limited.